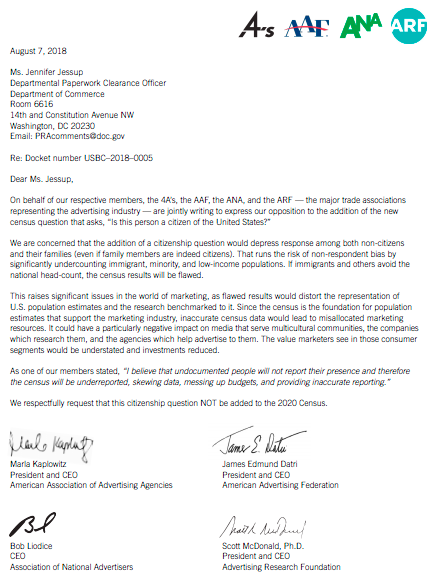 Citing the negative impact it will have on response rates -- and indirectly, the media and marketing research that is calibrated to it -- four of Madison Avenue’s leading trade associations this afternoon called on the U.S. government to back off its plans to add a “citizenship question” to the 2020 U.S. Census questionnaire. “We are concerned that the addition of a citizenship question would depress response among both non-citizens and their families (even if family members are indeed citizens),” the CEOs of the American Association of Advertising Agencies (4A’s), American Advertising Federation (AAF), Association of National Advertisers (ANA), and Advertising Research Foundation (ARF), wrote in a jointly signed letter sent to the U.S. Department of Commerce. Many marketing and media research studies used by marketers and agencies to plan and execute their marketing campaigns are designed to be representative of U.S. population estimates derived from the Census. In March, the Trump Administration announced intentions to add a question to the 2020 Census asking respondents to disclose their citizenship, ostensibly to help enforce the Voting Rights Act, but some critics have argued it might be a political move to reduce representation of immigrant populations in the government’s official population counts, which are also used for various appropriations and to draw up Congressional districts.